Blurb: Don't Get Scammed! Read this. Popular. -How we can guarantee you a good business credit profile. How? without any personal guarantee or credit history, though a secured visa business credit card! One with a guaranteed approval rating. No one has been turned down yet! -Twenty vendors that will lend to you with no personal guarantee! -How to avoid the mistake that 80% business owners make which results in a low Dun & Bradstreet ranking from the start. -Which 20 companies will lend to you without a personal guarantee? -Which companies will lend to you with little or no business credit history? -Who are the largest business credit bureaus? -What are the three top business credit scores? -What rights does a business owner have for incorrect information on a credit report? 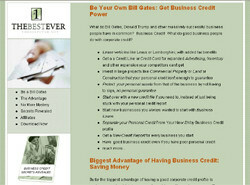 -How do I get a 75 (excellent corporate credit score) within 6 months? -What are the mistakes which about 80% of businesses make that lowers your chance at the highest corporate credit score? 2) there are many business credit cards supposedly available, secured or not, then you have to provide copious personal and business credit info, they end up denying you with little explanation (just like the personal credit cards) after they made you apply with a non-refundable fee.